A new mobile life with Samsung DeX. I always get a kick out of brainstorming (sometimes far out ideas, I admit) with my colleagues, constantly questioning what it will take to make our smartphones groundbreaking, yet more valuable and easier for everyone to use. Back in August 2014 one of those brainstorming sessions begged the question; “Can a smartphone really replace a desktop?” After a spirited discussion, one of the engineers in the room handed me a piece of paper, on which he drew the following. The idea he suggested was one where we placed a smartphone on a docking station connected to a monitor. In doing so, we could run all Android apps on the monitor as well as Windows apps using a Virtual Desktop Infrastructure (VDI)* while conveniently interacting with a keyboard and mouse. The idea was great, but unfortunately, we couldn’t fully realise it back in 2014 due to many obstacles that couldn’t be negotiated easily, such as the limited processing power on the device. However, we kept building on it, refining it and working on prototypes year after year while looking for an opportunity to bring it to our users. The Galaxy S8 is the vehicle that enabled us to introduce our 3-year endeavour, realising a modest dream, literally born from a piece of paper and some spirited discussion. We live in a constantly changing mobile world where all the content and information that entertain and inspire us begins and ends with our phones. We surf the web; we watch movies, we play games – all using a device small enough to fit in our pockets. 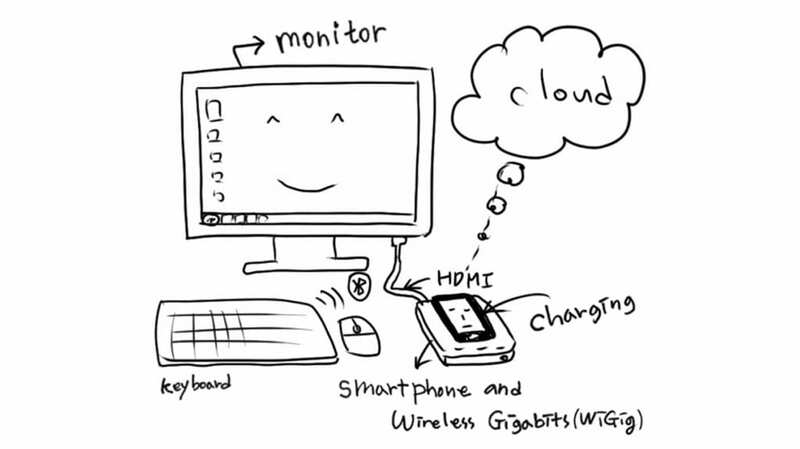 Now, what if you could connect your smartphone to a monitor, keyboard, and mouse and use it like a desktop? Of course, you might have to turn on your desktop for more complex tasks or gaming, but Samsung DeX adds tremendous value by enhancing the mobile experience for the mobile workforce. And to extend the user experience, Samsung DeX can connect to your TV at home to using an HDMI cable. Galaxy S8’s Infinity Display is a marvellous technical achievement in itself, but connected to your TV, Galaxy S8 with Samsung DeX enables you to play a movie on your TV while also texting your friends or surfing the web on Samsung’s Internet. Now imagine those places you often visit, such as cafés, airports or hotel lounges. With Samsung DeX, all you need is your Galaxy S8 to continue your mobile experience conveniently and securely whether you’re surfing the web, checking your emails, or watching your favourite movies. You don’t have to worry about having to enter your password to login or reveal any personal information using public computers. It’s with this idea we introduce the values and the vision of Samsung DeX. For example, the 10-nano application processor (Aps) used in the Galaxy S8 provides a performance level equivalent to PCs. Additionally, the Galaxy S8’s USB type-C technology enables transmitting video and images to the monitor faster while maintaining high fidelity. The DeX Station, Samsung DeX’s companion product, is ergonomically designed for the Galaxy S8 to create a completely different mobile experience. The high performance and innovation of the Galaxy S8 has enabled the simplified desktop experience of Samsung DeX. We will continue to strive to build and improve services for Samsung DeX, taking full advantage of our strength in hardware and our fresh approach to software development. Our partnerships with Microsoft and Hancom bring the best Samsung DeX user experience to the applications our users are familiar with. Adobe, well known for Photoshop among many other products, is a launch partner of ours, as are Citrix, VMware, and Amazon, who are providing VDI services. We maximised key Android features and capabilities and built the optimised user experience for Samsung DeX based on Android 7.0. Moreover, Samsung DeX doesn’t require developers to do anything specific for applications to be compatible. Any applications developed with the Android 7.0 developer’s guide in mind will run on Samsung DeX, bringing a desktop-like experience to users. We have a dedicated website for developers, which I invite you to visit, share, and to collaborate with us. All of our latest services offerings including Bixby, Samsung DeX and Samsung Connect share a common vision of pushing the boundaries that exist with smartphones. When our full vision for Bixby is realised, I believe Bixby will break the boundaries of touch-based interfaces with intuitive voice interactions enhanced by AI. Samsung DeX opens up a new world that frees our users from the boundaries of a small screen. It provides individuals with an option to view and enjoy content on a larger screen, and interact with others more conveniently with a keyboard and mouse. In other words, Samsung DeX expands how users interact with their devices through enabling a totally new mobile experience. Let’s imagine, for a moment, what the future holds. At home, while streaming your favourite movie on your big screen TV from your smartphone via Samsung DeX, you could tell Bixby, “It feels too warm in here.” Bixby would intelligently understand you and turns on the air-conditioning with the help of Samsung Connect. What we propose here at Samsung, is a smarter life with your mobile phone at its centre. With the dream that was Samsung DeX now fully realised, I firmly believe we are approaching the edge of a new mobile frontier much sooner than we think.